technologically important indigenous starter cultures. Keywords: Ayib; Dhanaan; Ergo; Ethiopian dairy products; Ititu. Abdelabasset, M. and Djamila, K. 2008. Antimicrobial activity of autochthonous lactic acid bacteria isolated from Algerian traditional fermented milk “Raïb”. Afrrican Journal of Biotechnology, 7 (16): 2908-2914. Assefa, E., Beyene, F. and Santhanam, A. 2008. Isolation and characterization of inhibitory substance producing lactic acid bacteria from Ergo, Ethiopian traditional fermented milk. Livestock Research For Rural Development, 20 (3): 44-47. Ashenafi, M. 1996. Effect of container smoking and incubation temperature on the microbiological and some biochemical qualities of fermenting ergo, traditional Ethiopian sour milk. International Dairy Journal, 6: 95–104. Ashenafi, M. 2006. A review on the microbiology of indigenous fermented foods and beverages of Ethiopia. 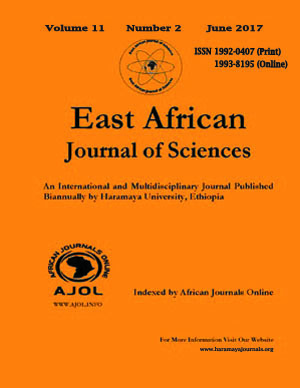 Ethiopian Journal of Biological Sciences, 5(2): 189-245. Ashenafi, M. and Fikadu, B. 1994. Microbial load, micro flora and keeping quality of raw and pasteurized milk from dairy farm. African journal of science, 43: 171-176. Bekele, T. and Kebebew, T. 2001. Camel Production and Productivity in Eastern Lowlands of Ethiopia. Proceedings of the 9th annual conference of the Ethiopian Society of Animal Production (ESAP) held in Addis Ababa, Ethiopia, August 30-31. Berhe, T, Seifu, E. and Kurtu, M. Y. 2013. Physicochemical properties of butter made from camel milk. International Dairy Journal, 31: 51-54. CSA (Central Statistical Agency) 2017. Population Projection of Ethiopia for all Regions at Wereda Level from 2014 – 2017. Addis Ababa, Ethiopia. El-Agamy, E. I., Nawar, M., Shamsia, S. M., Awad, S. and Haenlein, G. F. W. 2009. Are camel milk proteins convenient to the nutrition of cow milk allergic children? Small Ruminant Research, 82: 1–6. FAO (Food and Agriculture Organization) 1990. The technology of traditional milk products in developing countries. FAO Animal Production and Health Paper 85. Food and Agriculture Organization of the United Nations, Rome, Italy, pp: 333. Francesconi, G. N, Heerink, N and Haese, M. D. 2010. Evolution and challenges of dairy supply chains: Evidence from supermarkets, industries and consumers in Ethiopia. Food Policy 35: 60–68. Gebreselassie, G., Abrahamsen, R. K., Beyene, F and. Narvhus, J. A. 2012. A survey on spontaneously fermented buttermilk in Northern Ethiopia. African Journal of Food Science and Technology, 3(3): 78-89. Gonfa, A, Alemu, F., Urga, K., and Abegaz, B. 1999. Microbiological aspects of Ergo (Ititu) fermentation. SINET: Ethiopian Journal of Science, 22(2): 283-290. Gonfa, A., Foster, H. A. and Holzapfel, W. H. 2001. Field survey and literature review on traditional fermented milk products of Ethiopia. International Journal of Food Microbiology, 68:173-186. Harlan, J. R. 1969. Ethiopia: A Center of Diversity. Economic Botany, 23 (4): 309-314. Kassa, B. and Seifu, E. 2012. Physicochemical properties and microbiological quality of Dhanaan: traditional fermented camel milk produced in eastern Ethiopia MSc thesis submitted to school of Animal and Range Sciences, Haramaya University, Ethiopia. Kassaye, T., Simpson, B.K., Smith, J. P. and O'Connor, C. B. 1991. Chemical and microbiological Characteristics of 'Ititu'. Milchwissensch, 46: 649-653. Khan, K. U., and Appena, T. C. 1967. Carotene and vitamin A in camel milk. Journal of Nutrition and Dietetics, 4: 17-20. Knoess, K. H., Makhudum, A. J., Rafiq, M., and Hafeez, M. 1986. Milk production potential of the dromedary with special reference to the province of Punjab, Pakistan. World Animal Review, 57: 11-21. LSM (Livestock Resources Development Sector, Livestock State Ministry State Ministry, Ministry of Agriculture). 2014. Livestock sector analysis report. Addis Ababa, Ethiopia: MoA. Mekonen, A., Mahder, P. and Moses, N. K. 2011. Isolation and identification of staphylococcus speces from Ethiopian cottage cheese (Ayib) from Debrezeit. Ethiopian Veterinary Research, 4(1): 13-17. Mora, D., Fortina, M. G., Parini, C., Daffonchio, D. and Manachini, P. L. 2000. Genomic subpopulations within the species Pediococcus acidilacti detected by multilocus typing analysis: relationship between peptide through a three - component regulatory system. Microbiology. 146: 2155-2160. O’Connor, C. B. and Tripathi, B. R. 1992. Milk Processing Techniques— Sour Milk. ILCA, Addis Ababa, Ethiopia, No. 2, pp. 20. Salami, M., Yousefi, R., Ehsania, M. R., Razavi, S. H., Chobert, J. M., Haertle, T., Saboury, A. A., Atri, M. S., Niasari N. A., Ahmad, F., Moosavi-Movahedi, A. A. 2009. Enzymatic digestion and antioxidant activity of the native and molten globule states of camel α-lactalbumin: possible significance for use in infant formula. International Dairy Journal, 19: 518–523. Seifu, E., 2013. Chemical composition and microbiological quality of Metata Ayib: a traditional Ethiopian fermented cottage cheese. International Food Research Journal, 20(1): 93-97. Seifu, E., Abraham, A., Kurtu, M. Y., Yilma, Y. 2012. Isolation and characterization of lactic acid bacteria from Ititu: Ethiopian traditional fermented camel milk. Journal of Camelid Science, 5: 82-98. Seifu, E. and Tassew, A. 2014. Small-scale milk processing, utilization and marketing of traditional dairy products in Bahir Dar Zuria and Mecha districts, northwestern Ethiopia. Journal of Food Technology Research, 1(3): 122-132. Tolera, M. 2008. Woody species diversity in a changing landscape in the south-central highlands of Ethiopia. Agriculture, Ecosystems and Environment, 128: 52–58. Yagil, R. and Etzion, Z. 1980. The effect of drought conditions on the quality of camels’ milk. Journal of Dairy Research, 47: 159-166.